Oxford marked their return to the Carling Cup after four years away with a stunning victory over Bristol Rovers. Simon Heslop fired home from 20 yards to give them the lead and Matt Green made it two from captain James Constable's brilliant through-ball. Chris Lines gave Rovers hope from the edge of the box but Constable made it 3-1 after a one-two with Green. Jack Midson tapped in and Constable added a spectacular volley, before Heslop fired home a last-gasp sixth. 92:37 The ref blows the whistle to begin the match. 90:00+1:37 Assist (pass) by Damian Batt (Oxford Utd) from right wing. 90:00+1:37 GOAL - Simon Heslop:Oxford Utd 6 - 1 Bristol Rovers goal by Simon Heslop (Oxford Utd) right-footed (bottom-left of goal) from right channel (20 yards).Oxford Utd 6-1 Bristol Rovers. 90:00+0:20 Attacking throw-in by Damian Batt (Oxford Utd). 89:16 Alfie Potter (Oxford Utd) caught offside. Indirect free kick taken right-footed by Mike Green (Bristol Rovers) from own half, passed. 89:05 Foul by James Tunnicliffe (Bristol Rovers) on Jack Midson (Oxford Utd). Indirect free kick taken right-footed by Simon Heslop (Oxford Utd) from right wing, resulting in open play. 88:13 Attacking throw-in by Gary Sawyer (Bristol Rovers). 86:59 Sam Deering (Oxford Utd) caught offside. Indirect free kick taken right-footed by Byron Anthony (Bristol Rovers) from own half, resulting in open play. 86:51 Goal kick taken long by Ryan Clarke (Oxford Utd). 86:28 Cross by Gary Sawyer (Bristol Rovers), shot by Chris Lines (Bristol Rovers) right-footed from centre of penalty area (18 yards), missed left. 85:04 Shot by Jack Midson (Oxford Utd) left-footed from left side of penalty area (18 yards), missed left. Correction - 83:44 Goal kick taken short by Mike Green (Bristol Rovers). 83:44 Goal kick taken long by Mike Green (Bristol Rovers). 82:19 Defending throw-in by Carl Regan (Bristol Rovers). 81:17 Attacking throw-in by Anthony Tonkin (Oxford Utd). 79:42 Outswinging corner from right by-line taken right-footed by Stuart Campbell (Bristol Rovers) to centre, clearance by Harry Worley (Oxford Utd). 79:10 Goal kick taken long by Mike Green (Bristol Rovers). 78:45 Cross by Damian Batt (Oxford Utd), header by Jack Midson (Oxford Utd) from centre of penalty area (12 yards), over the bar. 78:23 Foul by James Tunnicliffe (Bristol Rovers) on Sam Deering (Oxford Utd). Indirect free kick taken right-footed by Sam Deering (Oxford Utd) from right channel, passed. 78:02 Defending throw-in by Anthony Tonkin (Oxford Utd). 77:01 Indirect free kick taken right-footed by Ryan Clarke (Oxford Utd) from own half, resulting in open play. 77:01 Substitution Oxford Utd substitution: James Constable replaced by Sam Deering (tactical). 77:01 Will Hoskins (Bristol Rovers) caught offside. 76:18 Shot by Jack Midson (Oxford Utd) right-footed from right channel (20 yards), save (caught) by Mike Green (Bristol Rovers). 73:45 Cross by Simon Heslop (Oxford Utd), resulting in ball out of play. 72:53 Goal kick taken long by Mike Green (Bristol Rovers). 72:37 Shot by Simon Clist (Oxford Utd) left-footed from right channel (25 yards), missed right. 72:22 Defending throw-in by Gary Sawyer (Bristol Rovers). 71:44 Attacking throw-in by Anthony Tonkin (Oxford Utd). 71:05 Attacking throw-in by Gary Sawyer (Bristol Rovers). 69:25 Attacking throw-in by Anthony Tonkin (Oxford Utd). 68:43 Substitution Oxford Utd substitution: Asa Hall replaced by Simon Clist (tactical). 67:22 Substitution Bristol Rovers substitution: Jeff Hughes replaced by Ben Swallow (tactical). 66:14 Goal kick taken long by Ryan Clarke (Oxford Utd). 64:57 Attacking throw-in by Damian Batt (Oxford Utd). 64:11 Attacking throw-in by Damian Batt (Oxford Utd). 63:32 Attacking throw-in by Damian Batt (Oxford Utd). 62:49 Foul by Stuart Campbell (Bristol Rovers) on Asa Hall (Oxford Utd). Free kick crossed right-footed by Simon Heslop (Oxford Utd) from centre of penalty area, clearance by Gary Sawyer (Bristol Rovers). 62:34 Attacking throw-in by Damian Batt (Oxford Utd). 62:13 James Constable (Oxford Utd) caught offside. Indirect free kick taken right-footed by Mike Green (Bristol Rovers) from own half, resulting in open play. 61:47 Pass corner from left by-line taken by Simon Heslop (Oxford Utd) to short, resulting in open play. 61:25 Shot by Simon Heslop (Oxford Utd) right-footed from right channel (35 yards), save (tipped over) by Mike Green (Bristol Rovers). 61:03 Shot by Alfie Potter (Oxford Utd) right-footed from left side of penalty area (18 yards), resulting in open play. 59:46 Substitution Oxford Utd substitution: Matthew Green replaced by Alfie Potter (tactical). 58:10 Goal kick taken long by Ryan Clarke (Oxford Utd). 56:49 Attacking throw-in by Damian Batt (Oxford Utd). 55:56 Defending throw-in by Damian Batt (Oxford Utd). 55:18 Cross by Stuart Campbell (Bristol Rovers), clearance by Harry Worley (Oxford Utd). 54:50 Outswinging corner from right by-line taken right-footed by Stuart Campbell (Bristol Rovers) to centre, clearance by Dannie Bulman (Oxford Utd). 54:39 Cross by Charles Reece (Bristol Rovers), clearance by Dannie Bulman (Oxford Utd). 51:18 Assist (cross) by Damian Batt (Oxford Utd) from right wing. 51:18 GOAL - James Constable:Oxford Utd 5 - 1 Bristol Rovers Goal by James Constable (Oxford Utd) volleyed right-footed (bottom-left of goal) from centre of penalty area (12 yards).Oxford Utd 5-1 Bristol Rovers. 50:03 Indirect free kick taken right-footed by Byron Anthony (Bristol Rovers) from own half, resulting in open play. 50:03 Substitution Bristol Rovers substitution: Dominic Blizzard replaced by Charles Reece (tactical). 50:03 Foul by Jack Midson (Oxford Utd) on Byron Anthony (Bristol Rovers). 49:05 Goal kick taken long by Ryan Clarke (Oxford Utd). 48:18 Shot by Matthew Green (Oxford Utd) right-footed from right side of penalty area (12 yards), missed left. 47:09 Cross by Damian Batt (Oxford Utd), clearance by Carl Regan (Bristol Rovers). 46:26 Attacking throw-in by Anthony Tonkin (Oxford Utd). 45:52 Shot by Jo Kuffour (Bristol Rovers) right-footed from left channel (20 yards), missed left. 45:00+1:25 Goal kick taken long by Mike Green (Bristol Rovers). 45:00+0:49 Attacking throw-in by Anthony Tonkin (Oxford Utd). 44:44 Defending throw-in by Carl Regan (Bristol Rovers). 44:27 Attacking throw-in by Anthony Tonkin (Oxford Utd). 44:04 Attacking throw-in by Anthony Tonkin (Oxford Utd). 43:07 Defending throw-in by Gary Sawyer (Bristol Rovers). 41:58 Attacking throw-in by Anthony Tonkin (Oxford Utd). 41:22 Goal kick taken long by Mike Green (Bristol Rovers). 41:13 Shot by Matthew Green (Oxford Utd) right-footed from centre of penalty area (18 yards), missed right. 40:32 Defending throw-in by Anthony Tonkin (Oxford Utd). 39:52 Shot by James Tunnicliffe (Bristol Rovers) right-footed from right channel (35+ yards), over the bar. 39:04 Attacking throw-in by Gary Sawyer (Bristol Rovers). 38:39 Outswinging corner from right by-line taken right-footed by Stuart Campbell (Bristol Rovers) to centre, clearance by Anthony Tonkin (Oxford Utd). 38:20 Outswinging corner from right by-line taken right-footed by Stuart Campbell (Bristol Rovers) to centre, clearance by Anthony Tonkin (Oxford Utd). 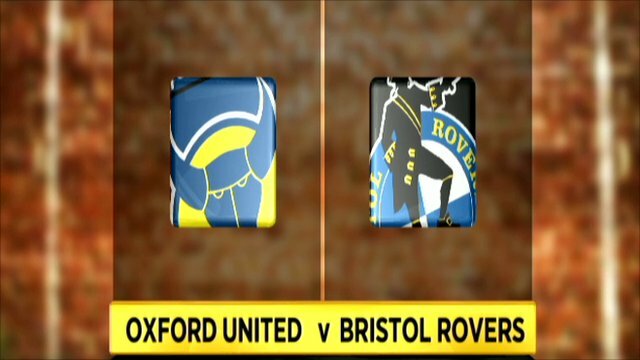 38:13 Cross by Chris Lines (Bristol Rovers), blocked by Anthony Tonkin (Oxford Utd). 37:50 Attacking throw-in by Gary Sawyer (Bristol Rovers). 35:41 Shot by Chris Lines (Bristol Rovers) right-footed from left channel (25 yards), over the bar. 35:21 Foul by James Constable (Oxford Utd) on Stuart Campbell (Bristol Rovers). Indirect free kick taken right-footed by Stuart Campbell (Bristol Rovers) from left channel, resulting in open play. 34:34 Attacking throw-in by Carl Regan (Bristol Rovers). 33:25 Goal kick taken long by Ryan Clarke (Oxford Utd). 31:10 Foul by Matthew Green (Oxford Utd) on Gary Sawyer (Bristol Rovers). Indirect free kick taken right-footed by Mike Green (Bristol Rovers) from own half, resulting in open play. 28:59 Assist (pass) by James Constable (Oxford Utd) from right channel. 28:59 GOAL - Jack Midson:Oxford Utd 4 - 1 Bristol Rovers Goal by Jack Midson (Oxford Utd) right-footed (bottom-left of goal) from centre of penalty area (12 yards).Oxford Utd 4-1 Bristol Rovers. 26:30 Assist (pass) by Matthew Green (Oxford Utd) from centre of penalty area. 26:30 GOAL - James Constable:Oxford Utd 3 - 1 Bristol Rovers Goal by James Constable (Oxford Utd) right-footed (bottom-left of goal) from centre of penalty area (12 yards).Oxford Utd 3-1 Bristol Rovers. 25:57 Attacking throw-in by Carl Regan (Bristol Rovers). 24:21 Outswinging corner from right by-line taken right-footed by Simon Heslop (Oxford Utd) to centre, clearance by James Tunnicliffe (Bristol Rovers). 23:12 Assist (pass) by Jo Kuffour (Bristol Rovers) from left side of penalty area. 23:12 GOAL - Chris Lines:Oxford Utd 2 - 1 Bristol Rovers Goal by Chris Lines (Bristol Rovers) left-footed (bottom-left of goal) from right channel (20 yards).Oxford Utd 2-1 Bristol Rovers. 22:07 Assist (pass) by James Constable (Oxford Utd) from own half. 22:07 GOAL - Matthew Green:Oxford Utd 2 - 0 Bristol Rovers Goal by Matthew Green (Oxford Utd) right-footed (high centre of goal) from right channel (20 yards).Oxford Utd 2-0 Bristol Rovers. 21:08 Attacking throw-in by Gary Sawyer (Bristol Rovers). 20:25 Defending throw-in by Carl Regan (Bristol Rovers). 19:50 Outswinging corner from right by-line taken right-footed by Stuart Campbell (Bristol Rovers) to near post, clearance by James Constable (Oxford Utd). 19:38 Shot by Jo Kuffour (Bristol Rovers) right-footed from right side of penalty area (12 yards), blocked by Jake Wright (Oxford Utd). 18:00 Assist (pass) by James Constable (Oxford Utd) from right side of penalty area. 18:00 GOAL - Simon Heslop:Oxford Utd 1 - 0 Bristol Rovers Goal by Simon Heslop (Oxford Utd) right-footed (bottom-left of goal) from right channel (20 yards).Oxford Utd 1-0 Bristol Rovers. 15:49 Cross by Matthew Green (Oxford Utd), clearance by Carl Regan (Bristol Rovers). 15:25 Shot by James Constable (Oxford Utd) right-footed from right channel (20 yards), blocked by James Tunnicliffe (Bristol Rovers). 15:18 Goal kick taken long by Ryan Clarke (Oxford Utd). 15:10 Cross by Will Hoskins (Bristol Rovers), save (caught) by Ryan Clarke (Oxford Utd). 14:04 Goal kick taken long by Ryan Clarke (Oxford Utd). 13:30 Foul by Matthew Green (Oxford Utd) on Stuart Campbell (Bristol Rovers). Direct free kick taken right-footed by Gary Sawyer (Bristol Rovers) from left wing, passed. 13:03 Attacking throw-in by Gary Sawyer (Bristol Rovers). 12:37 James Constable (Oxford Utd) caught offside. Indirect free kick taken right-footed by Mike Green (Bristol Rovers) from own half, resulting in open play. 12:28 Goal kick taken long by Ryan Clarke (Oxford Utd). 12:03 Shot by Stuart Campbell (Bristol Rovers) right-footed from left side of penalty area (18 yards), over the bar. 11:40 Cross by Matthew Green (Oxford Utd), blocked by James Tunnicliffe (Bristol Rovers). 10:57 Foul by Dannie Bulman (Oxford Utd) on Will Hoskins (Bristol Rovers). Indirect free kick taken right-footed by Byron Anthony (Bristol Rovers) from own half, passed. 9:54 Attacking throw-in by Gary Sawyer (Bristol Rovers). 9:36 Inswinging corner from left by-line taken right-footed by Stuart Campbell (Bristol Rovers) to centre, clearance by Jack Midson (Oxford Utd). 9:19 Cross by Carl Regan (Bristol Rovers), clearance by Damian Batt (Oxford Utd). 8:33 Goal kick taken long by Ryan Clarke (Oxford Utd). 7:36 Defending throw-in by Gary Sawyer (Bristol Rovers). 7:20 Attacking throw-in by Damian Batt (Oxford Utd). 6:59 Goal kick taken long by Mike Green (Bristol Rovers). 6:24 Outswinging corner from right by-line taken right-footed by Simon Heslop (Oxford Utd) to centre, header by James Constable (Oxford Utd) from centre of penalty area (12 yards), missed right. 5:56 Attacking throw-in by Damian Batt (Oxford Utd). 5:48 Attacking throw-in by Damian Batt (Oxford Utd). 5:37 Attacking throw-in by Damian Batt (Oxford Utd). 4:50 Attacking throw-in by Damian Batt (Oxford Utd). 4:34 Defending throw-in by Damian Batt (Oxford Utd). 4:11 Attacking throw-in by Gary Sawyer (Bristol Rovers). 3:48 Goal kick taken long by Mike Green (Bristol Rovers). 3:17 Defending throw-in by Gary Sawyer (Bristol Rovers). 3:11 Goal kick taken long by Ryan Clarke (Oxford Utd). 2:07 Foul by Will Hoskins (Bristol Rovers) on Dannie Bulman (Oxford Utd). Direct free kick taken right-footed by Jake Wright (Oxford Utd) from right channel, resulting in open play. 1:11 Jo Kuffour (Bristol Rovers) caught offside. Indirect free kick taken right-footed by Ryan Clarke (Oxford Utd) from own half, resulting in open play. 0:35 Attacking throw-in by Gary Sawyer (Bristol Rovers). 0:31 Goal kick taken long by Mike Green (Bristol Rovers).